Take the Vintage-Inspired Modern Style Design Challenge! We’ve got some BIG news! Are you ready? We just heard about this awesome opportunity to have your work published internationally and win $3,000 in prizes. It’s called the “Vintage-Inspired Modern Style Design Challenge” and it’s hosted by BurdaStyle. To celebrate the milestone anniversaries of two of the biggest companies in sewing, SINGER and Coats & Clark, and the life of Mary Brooks Picken, the fashion and dressmaking trailblazer of the mid 1900s, BurdaStyle presents this fun challenge. Participants are asked to choose one of the patterns found in Amy Barickman’s book, Vintage Notions or a purchased or free e-pattern found on the Indygo Junction website. 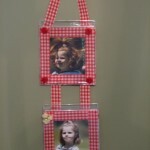 Take your chosen pattern and make it your own! Put your own spin on the project to create a stylish and wearable fashion garment. Pieces will be judged on originality, craftsmanship and overall appeal. Creativity is strongly encouraged! The deadline to enter is March 12, 2012. For official rules, prize details and how to enter, visit the BurdaStyle website. For all of the challenge information, watch the video below. Amy Barickman will let you in on all the important details! One more thing! As a little added bonus, we’ve got a special promo code you can use to take 20% off a one-time order at IndygoJunction.com. Enter the code VMCB and click “update cart” before purchasing to receive your discount! We’re giving one lucky winner a copy of this book. It could be you! Contest ends December 26, 2011. You can enter once daily, so return often to increase your chances of winning! What do you like about online sewing communities like the ones found on AllFreeSewing.com and BurdaStyle.com? 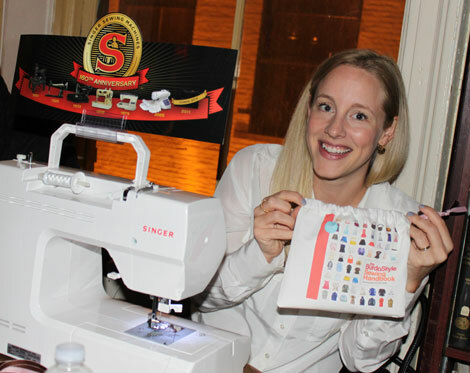 Creativity on Display at the BurdaStyle Book Launch Party in NYC + Giveaway! This guest post was written by Rachel Johnson for Rachel & the City. BurdaStyle.com is an online community for people who like to sew. The website, which has more than 600,000 members, offers free and inexpensive sewing patterns, step-by step sewing tutorials, skill sharing, and inspirtional project ideas. 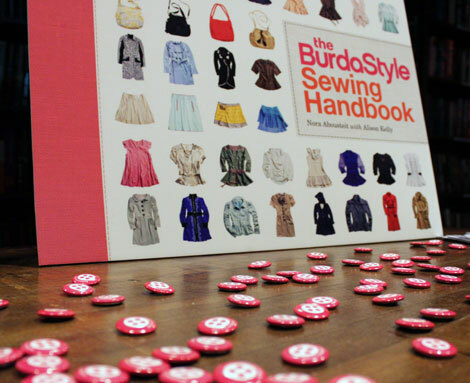 Last Thursday they launched their very first book, The BurdaStyle Sewing Handbook. BurdaStyle co-founder and author of the new book, Nora Abousteit, and her staff hosted a large and exciting book launch party Thursday night at the Housing Works Bookstore in New York City. 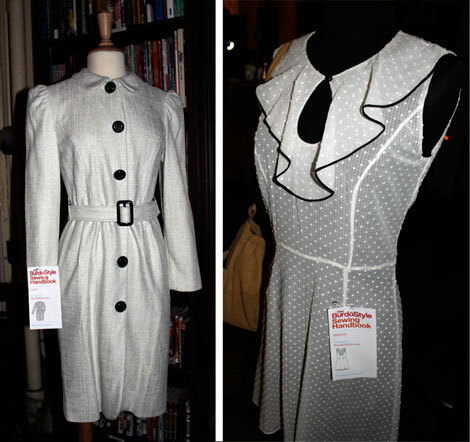 Examples of finished items created using sewing patterns from the new book were on display throughout the loft-like space. There were snacks and drinks, craft tables with make-and-take projects, and a photo booth from HaveBoothWillTravel.com. There was even a cake printed with the Sewing Handbook cover image! My first stop at the event was at the Singer make-and-take table. I used a Singer sewing machine and Spoonflower fabric printed with the BurdaStyle Sewing Handbook cover to make a quick, little, drawstring bag. I was nervous to put my sewing machine skills on display since I was surrounding by so many talented and creative seamstresses, but the project was easy and basically error-proof. Next, I headed over to the glitter tattoo table. 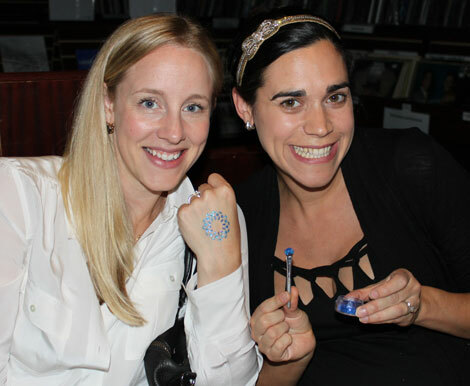 Megan Nicolay of Generation T and ILoveToCreate.com was applying sparkly designs to any willing party guest using stencils and Tulip Body Art Glitter. I played it safe and got an abstract flower on my hand. 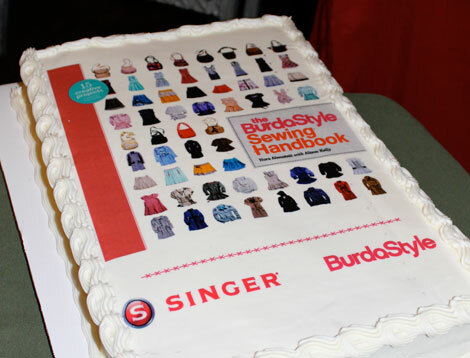 Copies of the The BurdaStyle Sewing Handbook were available to purchase at the event. The 200-page, spiral-bound book contains over seventy step-by-step variations of five basic patterns: a blouse, skirt, dress, bag, and jacket. 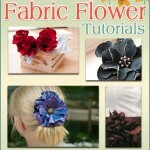 It has a large intro section that can help those new to sewing get started using patterns. There are also plenty of full-color photos of the finished projects, plus profiles of BurdaStyle.com members from all over the world. The full-size patterns are also included in an envelope inside the back cover of the book. It was exciting to meet the people behind the huge BurdaStyle community and to see much of the creativity from the website translated into book form. 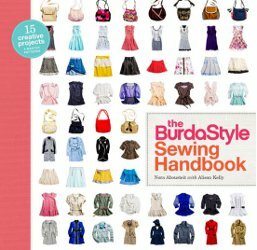 The BurdaStyle Sewing Handbook is a fun project book for both beginners and experienced seamstresses that will help you endlessly customize your wardrobe. 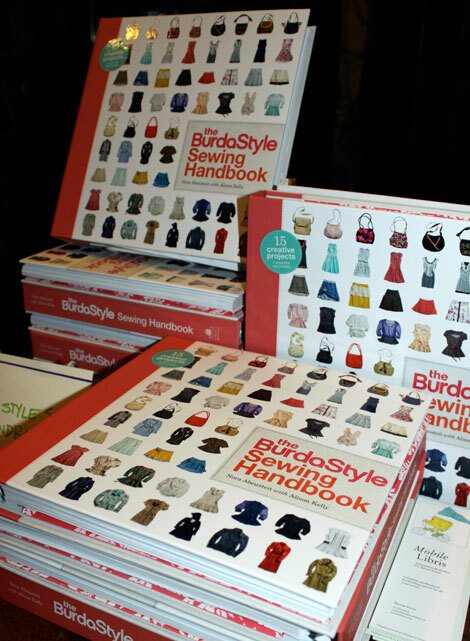 We’re giving away a copy of The Burdastyle Sewing Handbookto one lucky FaveCrafts Blog reader! Which project from the book would you sew first? ■ Link to the this giveaway on Facebook! Here’s the link for you – http://bit.ly/rB35au or click the Share Link at the bottom of this post. ■ Blog about this Giveaway. Please enter one comment per entry. So, once you have done any of the additional entries remember to come back and comment to let us know. Contest closes on Wednesday, November 23rd at midnight CST. One reader will be selected at random. Good Luck!